Knowledge is power, and knowing more about your pages and forms is the first step toward optimizing your marketing. Luckily, we automatically track data for you, so you can gain quick insights into how your forms are performing. In this guide, we’ll walk through how you can view your analytics data, visualize your page’s performance across time, and more. If you’re looking for more information on split testing, we have additional resources available here. If you’re noticing strange numbers, check out our Analytics Troubleshooting Guide—this article isn’t designed to cover troubleshooting issues. Our analytics system tracks page views and form submissions. To gather more detailed data about your pages, you can add third-party tracking code (such as Google Analytics). Check out our article here for more information: Use Third-Party Analytics. A conversion within Leadpages analytics is a form submission (an opt-in). When you publish a page or pop-up, we’ll automatically track its views and conversions. To view your analytics, navigate to the Lead Pages or Conversion Tools > Pop-Ups tab in your account. WARNING: We are not able to track analytics for pages published via our Advanced HTML Export option. In the list view, we display unique views, opt-ins, your conversion rate, and earnings (if you're using Checkouts) so you can review how your pages and boxes are doing at a glance. To see your analytics data in-depth, click any number to jump right into a more detailed view. Or, click the graph icon next to your page (as shown in the example above). Understanding each of these numbers—and how they’re calculated—will help you gain valuable insights into your page or form’s performance. Anytime someone visits your page or pop-up, a new view will get calculated. In most cases, if the same person visits your page or form again, we’ll count a new view but not a new unique view. For pop-ups, keep in mind we only track a view when someone opens your pop-up. We do not directly track pages where your pop-ups are hosted. NOTE: A visitor who clears their cache or cookies should still register as the same unique viewer. However, if they were to visit your page from a new browser (such as on their mobile device), they would count as an additional unique visitor. By comparing total views to unique views, you can get a general idea of how many visitors return to your page or form. For instance, if a single visitor were to open your page a hundred times, 100 page views would be counted, but only one unique view. We count a conversion any time a visitor submits a form on your page, regardless of whether or not they've already opted in previously. For instance, if 200 people sign up for your newsletter, we’ll count exactly 200 conversions. TIP: If your page contains multiple forms, we’ll calculate the total number of conversions for the entire page. At this time, our system only counts form submissions as a conversion. If your page’s call to action leads to another URL, like a sales page or survey—anything other than a Leapages form—you might consider using a third-party analytics platform. 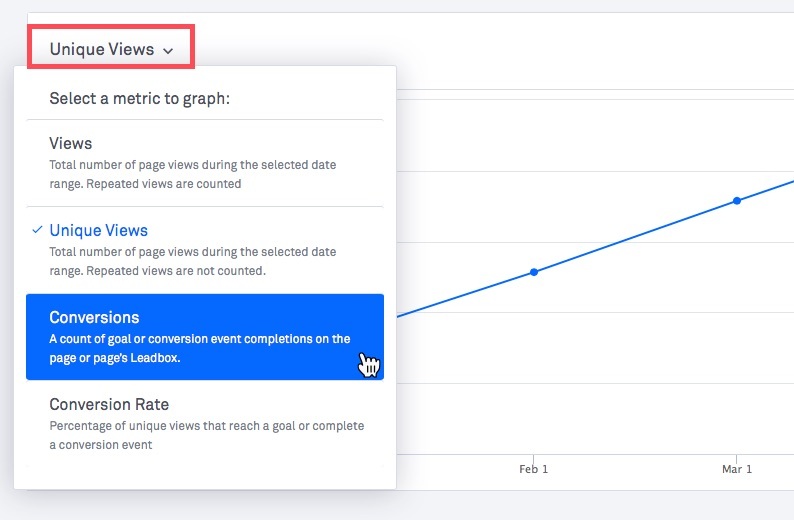 The analytics page for each of your pages and pop-ups features a powerful, customizable graph so you can visualize your forms’ performance over time. Below, we’ll cover all the options available for customizing the analytics graph. To change which metric is graphed (such as views or conversions), click the drop-down menu in the top-left corner of the graph area and select whichever metric you’d like to view. Keep in mind, the vertical axis will automatically adjust to show relevant numbers for your page. This is important to consider if you ever compare graphs from multiple pages, as the numbers may differ even if the graphs look similar. To adjust the date range of your data, click the calendar icon next to your page (or pop-up) title. From there, choose a pre-defined range or select “Custom” to put in your own dates. NOTE: When you adjust your analytics date range, the “Page Summary” will only reflect totals for your chosen time period. By default, the graph will display monthly data, but you can also view daily or hourly statistics for certain date ranges. As you increase your chosen date range, some data may not be available to display. You can view hourly analytics for the past seven days, and daily analytics for the past 90 days. For instance, when viewing analytics for the past two days, you can select hourly, daily, or monthly views. But for page data from the past six months, the graph will only display month-by-month intervals. To actually change the time interval of the graph, click the “Monthly” drop-down menu and select a new option (as shown below). You will also notice a drop-down menu with a "Standard" viewing option, delivering a single data point for whichever time cycle you've chosen or "Cumulative," placing data points for the sum total according to the time cycle you've chosen.